I’ve always had an obsession with real life dystopian societies. At the ripe old age of fourteen, I delved into the corrupt worlds of Hitler’s German, Stalin’s Russia and apartheid South Africa. Dystopian novels such as 1984, Brave New World and Animal Farm kept me awake at night and during math class, sneaking in a few lines of reading. But my obsession didn’t stop there; I began creating my own worlds – making them as corrupt and dark as possible. I wanted to really “go there.” I’ve always wanted to go there. That’s just who I am. I don’t like limits and I will probably never accept them. I don’t want to censor myself and I don’t want to pretend that the world is a nice place where the bad guys get their comeuppance — eventually. I know that’s not true. That’s not to say that justice is never served – sometimes it is. And it’s not to say that every person is a low-life, corrupt scam bag – some of them really aren’t like that most of the time. But it is to say that the world can be a dark place and it’s up to the individual to not only fight the darkness of the world; but to resist the darkness within their own heart if they want to live a life that creates more good than suffering. Boxer, the loyal horse, is for me the most memorable character in “Animal Farm.” He believed in the system. He toiled away, breaking his back despite the fact that he never enjoyed the prosperity he helped to create. Even as they drove him away to the glue farm – he believed. By the time Boxer realized his true fate, it was too late. When I wrote “After The Darkness” I wanted to ask the question, “What happens when the “loyal workhorse” realizes that they’ve been duped?” I wanted to explore the choices people make and examine how they eventually become willing to face a Goliath of opposing forces. But I also wanted to show that heroism isn’t black and white. Heroes are flawed individuals who have decided to do something extraordinary despite their failings. Bleak dystopias give us a chance to take a closer look into the darker side of our real world society. Maybe we don’t live in a frozen wasteland like the one in “After The Darkness” where people are categorized, branded and sold to the highest bidder; but we do live in a world where people without power find themselves imprisoned indefinitely, murdered for speaking out against injustice or sexually assaulted because of their gender. Maybe it’s not happening in the United States or the U.K. or Canada on a mass scale; but it is happening to our neighbors separated only by an imaginary border, an ocean or even a few thousand miles of roads and fields. When we see our neighbors facing oppression, will we be the loyal horse or will we choose differently? After The Darkness on sale now $2.99 $1.99 for the month of August! 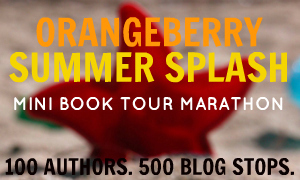 Part of the Orangeberry Book Tour. Special thanks to Book Connoisseur. As part of my participation in the Orangeberry Book Splash I’m discounting prices for the month of August.